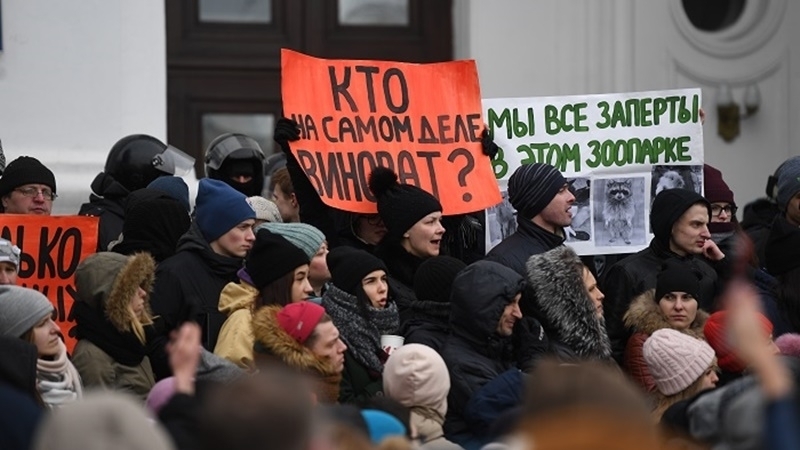 On March 27, residents of Kemerovo (Russia) went to a rally on Soviets Square because of a fire that occurred in the shopping and entertainment center "Winter Cherry" on March 25, which claimed the lives of 64 people. About 300 protesters gathered at the square and demanded from the city authorities to tell the truth about the incident, as many do not believe that the number of victims is true. Residents claim that after the fire started in the mall, too few rescuers arrived on the scene and they did not take the necessary measures to save people. Moreover, the emergency exits in the building were blocked, and the fire alarm did not work properly. Vice-governor of the Kemerovo region Sergey Tsivilev came before the city residents. The protesters began chanting "Truth!" And "Resignation!" According to preliminary data, the fire could kill about 40 children. Meanwhile, the security forces began arriving to the Soviets Square because of the demands of the activists for the resignation of the city governor. 6 paddock wagons with riot policemen and 5 ambulances drove up to the square. Reference: as a result of a fire in Kemerovo, 64 people were killed. The total area of the fire has reached 500 square meters. In total, 100 people were evacuated, 16 people are missing.